1. Lily Flame Candles - Lily Flame are amongst my favourite brand of candles, their smell is just right there in the middle of being too strong or not strong enough and for me that's perfect. Fairy dust & party time are always too of my favourites. I've opted away for Christmas scents because if I opened these on Christmas day, I don't want to still be feeling festive when burning them in January. 2. New Look Watch - When you have a changing bag as full as mine, there isn't much worse than trying to route around to find your phone and check the time. I desperately need a watch and I'm really not a huge fan of the crazy expensive style, I'm too clumsy and would almost definitely forget where I put it. So this little gem is perfect, at £9.99 you truly can't complain. It's classy and grey - perfect! 3. Sicilian Lemonade - Random I know. But I am in LOVE with the Fever Tree Sicilian Lemonade. I love lemons and this really tastes like drinking lemon juice without that bitter edge. I'd be delighted to find a bottle of this in my stocking. 4. Mirror - I have to have this mirror. My magnifying mirror currently on my dressing table is definitely ageing (and not well) plus, John always nabs it for the bathroom. This one is much more elegant and even has the most handy storage tray which would be a gem for tweezers and other nik naks. 5. First Aid Beauty - I've never used First Aid Beauty, minus a couple of samples in the past that I've really enjoyed. I've done my digging and judging by the reviews I've come across I feel like I should certainly try some more things out. This little gift set is the perfect way to do so & has their most popular products in too. 6. Bath Rack - The most expensive thing on my list, but still under £30, is this beautiful bath rack. It's a bit pricier than some others on the market but the fact it has a drinks & tablet holder makes it worth it in my eyes. It would make that bath time soak even more relaxing if I could sneak in a glass of bubbles. 7. Block Calendar - How gorgeous is this? To have this sitting on my desk would be a dream. Being on maternity leave makes it incredibly easy to forget what day or even month I'm in sometimes, especially with months flying by like minutes. At only £15 I truly think this is a stunning gift. 8. Slippers - What is Christmas without some new slippers? My current slippers have been going strong since Patricks birth, they were part of my hospital bag get up and are from Asda. However they have kept well considering they were £6, but I think it's time I treat my feet to something a little more luxurious, and these mules from Next are just the thing. Of course, in grey. 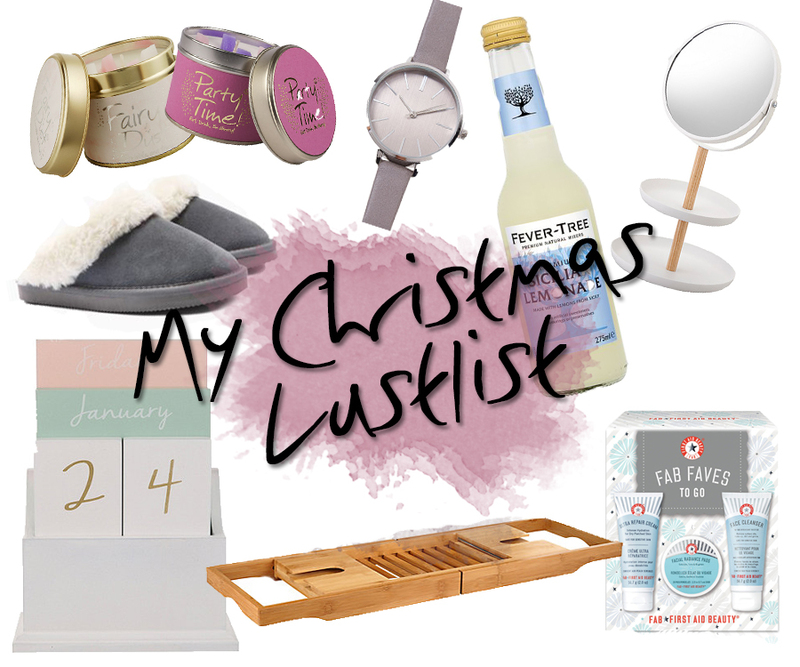 I hope you've enjoyed stopping by to nosey at what I'd love to receive under my tree, and without actually realising not one thing is over £30 so there is definitely some bargains to be had.